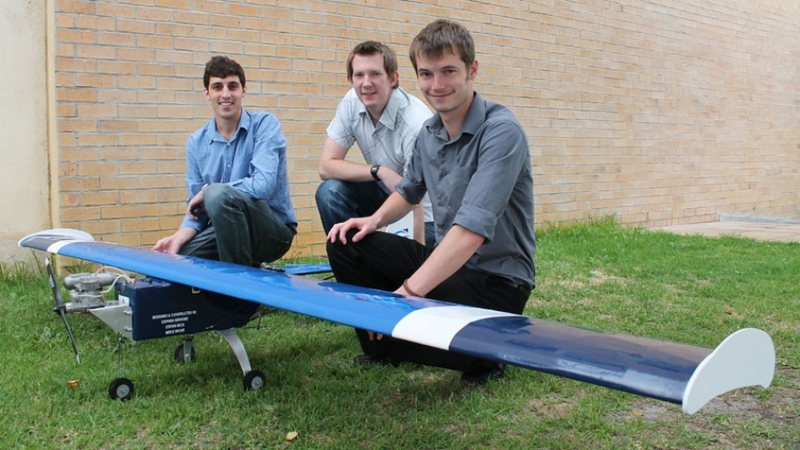 AVIATORS: Bryce Wicht, Steven Black and Stephen Benford with the aeroplane they designed and built as part of their BTech project. Mechanical Engineering students Bryce Wicht, Steven Black and Stephen Benford are proof that CPUT is producing the country’s next generation of innovators. This trio designed and manufactured a fully functional, remote aeroplane for their final BTech project. The aeroplane measures 3×1.5m, is 400m high and runs on methanol based fuel. The aeroplane has already taken to the skies, much to the delight of these students who spent the past few months developing this impressive device. Bryce says while it took them several weeks to build the aeroplane, the research and design phase took up the bulk of their time. “We originally designed two aeroplanes, but opted for this one,” he says. One of the goals of the project was to design a lightweight device that could carry a heavy payload. Instead of opting for conventional material used for such devices, the students used foam core ply board, a lightweight material used for the building of yachts. Stephen says the project was a challenge but that they are all pleased with the outcome. “The most gratifying part of this process was seeing the design come to life,” he says. Lecturer Walter Kohlhofer commended the students for their hard work and commitment to such an innovative project. He says the project exposed students to aerodynamics and other engineering principles, which forms a solid base for those wanting to pursue a master’s degree in the field of unmanned aerial vehicles systems.